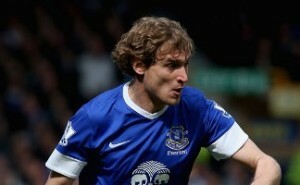 Interesting transfer news are out claiming that West Ham United are eyeing Everton striker Nikica Jelavic. The Sun reported that Everton boss David Moyes insists he wants him to stay. But having fallen behind Victor Anichebe in the Goodison pecking order, Jelavic is considering his future, despite three years left on his deal. Sam Allardyce’s side, who do not have the cash to make Andy Carroll’s loan move from Liverpool permanent, will throw their hat in the ring given any indication Jelavic wants out.